Toss all but greens together in a mixing bowl. Arrange greens on the bottom of each salad bowl. 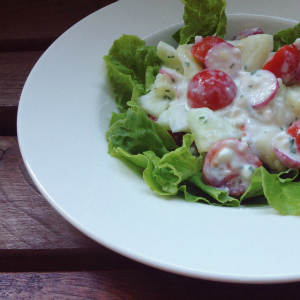 Top with the vegetable cottage cheese mixture and serve. What salads are born in your kitchen from what you have on hand? Be sure to let me know how you like this! 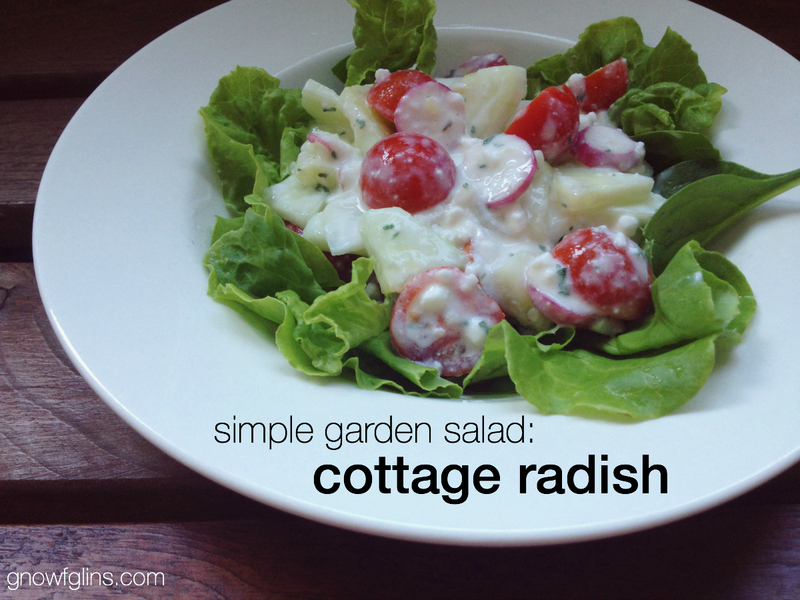 Want to do more with your radishes? Also see: Pickled Radishes and Pickled Radish Pods (both are lacto-fermented and oh-so-delicious). This post is part of the Using the Garden Veggies blog hop, hosted by Merissa at Little House Living. Each week through July and August, one participating blogger will feature a garden veggie. As you probably guessed, my veggie is the crisp and spicy radish. 🙂 Keep an eye out on our Facebook page throughout the summer for more garden fresh recipes. This post was featured in 33 Nourishing Main Dish Salads and 60 Easy and Nourishing Picnic Recipes. This looks so good! In a few months it will be cool enough to plant radishes again. Hopefully the heat will have been kind to the tomatoes and the cucumbers so I can give this a try. I think we’d really like it. Right now we’ve been eating a lot of marinated pole bean salads. Sometimes I toss them with a vinagrette, feta, and whatever herbs I happen to have on hand. In the middle of summer, I like adding raw coarsely grated young zucchini to our salads. I enjoy their almost creamy touch.